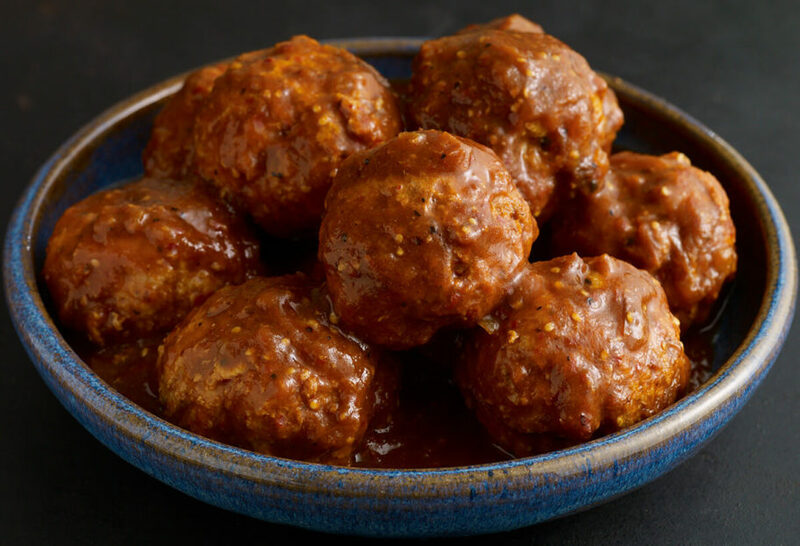 I made these meatballs and the flavor is an explosion of deliciousness! I’ve never cooked with these chili’s before. The combination of tanginess of the tomatillos with the subtle mild chicken broth blended so beautifully! I LOVE watching your show. You give me the courage to try some different recipes in the kitchen. Keep making our mouths water watching you cook! I hope you keep trying lots of recipes…and have lots of fun kitchen adventures! I tried this recipe, my version of it at least. I did it with chicken thighs and OMG it was delicious… it took me a little to find the ingredients but u did it. Proud of my improved Mexican cooking skills that’s to you. I made this recipe along with the Chepil Rice – except I didn’t use Chepil leaves. I wouldn’t know where to find this so I used cilantro. My 17 year old son, Christopher, loved the meatballs in the guajillo sauce. The rice served on the side absorbed some of the guajillo sauce and the whole meal was super delicious! I will definitely be adding this combo, permanently, to my repertoire. Oh thank you so much Sylvia!!! Can I use red tomatoes if I don’t have tomatillos at hand. Sure…It will be a different taste but also delicious​. I am about to make this, but I only have a little over 1 pound of tomatillos. Will it still work? Sure! I would just half the whole recipe to, so everything is still in proportion. I had left over Checken Brest pieces, so I cut them into bites and poached them in seasoned water…used this amazing sauce as a drizzle over Chicken burritos!! It was a HIT!!! Love your show, your recipes…I’ve learned so much about authentic Mexican Cuisine…and your sweet love for and within your family warms my heart!! You and your husband have raised 3 amazing young men!!! Oh I hope your chili comes out great, Elizabeth! me and my wife made your recipe and it was the best, there was plenty of sauce left so I added another cup of rice and a pound of ground beef and now we are going to have Guajillo soup tomorrow. thank you for sharing your recipe ! Oh great use of the leftovers, Thomas and Shelley! I have made these a couple times. They are amazing and so delicious. I make the rice but have to substitute baby watercress and a tiny bit of mint. It is amazing also. Thank you for amazing recipes. My wife loves your bracelet also. Oh say hi to your wife for me, Steven…and I hope you are having lots of fun kitchen adventures. Thanks so much for watching my show Ed. It can be frustrating to not find the ingredients, but the great thing is that they are becoming increasingly available. Talk to your grocers and request the items, the more they hear that their customers want them, the more they will source them! Fantastic. Have seen and tried meatballs from all over the world except this. Oh I hope you love these Mexican meatballs! Where can I buy a beautiful comal like yours? Oh mine is passed down from my mom…but you can find them all sorts of places, like online, your local kitchen store, Latin Market…and Mexico! Love these! Tender meatballs and the wonderful sauce. I added a tablespoon of brown sugar to manage the sour. It sent it over the top! So glad you made the recipe your own, Andrea! Which Season and Episode did you make this in? I’m making it for the 2nd time (BIG hit the 1st time) and I’d love to watch you on Amazon while I do it. Season six, episode 5…and I’m so glad they were a hit, Travis! The sauce was delicious. I did have to substitute ancho chilies because I could not get the guajillos locally. When I served it, some of the meatballs did fall apart, but I didn’t mind that- it made for a nice meaty sauce. We served it on rice, but I was kinda wondering if it would be good with spaghetti or linguini. Go for it! I hope you enjoy your Mexican spaghetti and meatballs, Doug. Love the flavor of the sauce but I had to add a couple of tablespoons of sugar as it was so sour. Pati. Me again. 😊. Love your show. You should be able to find it! Good luck. I know it pretty much ignores the whole meatball idea, but do you think cooking chicken breast in the sauce and then shredding it would work? Or would you put the shredded chicken in already cooked? Kind of like your chicken tinga? Thanks for your thoughts. Hi Pati! Do you have to use guajillo chiles or can other types of chiles be used like Colorado? I can’t wait to try this recipe. I love your show! Thanks! Of course you can try them with ground beef! Any ground protein will do. You can sub water for broth, but broth will help it have a bit more depth of flavor​. Delicious recipe. Worth the time and effort of making it. I would cut the recipe in half next time since we are only two people eating this. I made this recipe of yours on Saturday along with your Chepil Rice. I posted my completed food on FB and had alot of people saying they were coming over! Nobody made it, but there is still tonight. I love, love, love your programs. That’s awesome! Thank you for tuning in and for trying some recipes Jackie! i wish that i could spend a day with you cooking and visiting, your recipes ALWAYS turn out. The ingredients are easy to find here in OK and that makes a big difference. You are so fun to watch and my husband and i enjoy your show every chance that we get. Best wishes for a future that is as sunny as you! I’m so happy to hear that the recipes always turn out and the ingredients are easy for you to find Juliann! I hope you continue to enjoy the show and new recipes! what was the rice you made with these on your show? smells very good in our home.Also we love your show. Hi Patti….where does one find guallio dried chili’s and espizote? I live on Whidbey Island, WA. We are heading off to the mainland tomorrow and I only know of a couple of Mexican stores in Mt. Vernon. I know you said you can substitute w/cilantro and oh, and I can easily find Ancho dried chili’s. Also, do you suggest long grain or pearl rice. Try your local latin or international market…or even online for the dried chiles. It depends on the dish but for the rice I make with these meatballs (Arroz con Chepil) I recommend long grain rice. Have fun on the mainland! Sauce came out very nicely. I thought the meatballs were hard, however. If I made again, I would use beef instead of turkey breast. Or maybe just plain ground turkey with more fat in it. But the recipe taught me a valuable new technique — cooking with dried peppers and tomatillos. Thanks! I’m so glad you learned a new technique! Hi Hugh, I made this last month and the meatballs were very tender. You may have worked the meat too much. I would try it again with turkey but work the meat as little as possible. Good luck! I hope your co-workers enjoy the meatballs at the pot luck, Dianna! I’m so glad it was worth the effort Al! Hi Pati: Here is something to try? After we ate the meat balls, there was a nice amount of sauce left, so my wife took a 7.05 La Moderna Vermicelli Pasta noodles, boiled them, and than mixed with the sauce! Try it, it’s VERY good and filling! Take care, and Happy New Years. Que orgullo aprender de tus deliciousas recetas! Eres una inspiracion al conocer la autentica cocina Mexicana. Muchisimas Gracias! Esta receta deliciousa, mi Esposo facinado con todos los diferentes sabores. Delish! Sige dandonos mas!! Ole! I’m so happy that you liked your first recipe! Have a wonderful New Year filled with Mexican food! Rather than meatballs, would chicken thighs be appropriate? I assume they’d be cooked in the sauce for about the same amount of time. Please advise. Thank you. Oh give them a try! I made this recipe for a family birthday. 2 batches, one with ground beef, one with turkey. I was a little concerned about the spicyness of the dried Chiles. I got 2 brands of the same type Chile. Surprisingly, one was bland and the other was so spicy I used 4 instead of 6 pods. The dish was a hit. I like the tartness the tomatillos give the sauce and will use them more often now. I also made the chapil rice, although I couldn’t find the herb. I used the left over sauce and meatballs to make a vegetable, bean soup. Thanks Pati. I love your show. I’m so glad to hear it was a hit! When is the broth added? Add the broth once the tomatillo puree has cooked down and before you put in the meatballs. Hola pati.. Estoy haciendo tu recta deliciosa pero en la preparación no veo dónde se agrega el chicken both ?? Hola pati!! Puedo hacer estas albóndigas de carne molida o pollo en vez de pavo?? Saludos, gracias! I made this recipe last Sunday and my family loved it. It’s easy to make. I actually strained the sauce before adding to the meatballs to make it silkier. Thanks Pati for such flavorful and delicious recipes!! I’m glad the whole family loved it! I’m so happy they were a hit! This is going to be dinner for our family tomorrow. I let my kids stay up 30 extra minutes tonight and they cuddled up next to me to watch your show with me. What a treat that was to watch with my kiddos, we loved your show. We homeschool so this is going to be incorporated into tomorrow’s lessons. I’m glad I stumbled upon your cooking show. Thanks! I’m so glad you stumbled on the show too…and I’m happy that the recipe will part of your lesson and that the show is part of family time! wonderful dish!!! We had this today and can’t wait to make it again along with the rice and salad. Thank you for the recipe! the ground turkey and guajillo Chile was flavorful and spicy. recommend for every one. Hello Pati. I just finished cooking the meatballs and the sauce is delicious. Haven’t tasted the meatballs since I don’t like turkey at all but my family does. I added cilantro instead of epazote and a teaspoon of chicken bouillon. Next time I will make them with ground beef. Thanks for sharing your recipes. Thank YOU for trying them Maria! ​Absolutely! It will be a different taste but also delicious​. I like to use egg as a binder…but please make the recipe your own. And I’m glad you enjoyed the guajilllo sauce! I made these meatballs last night. They were amazing!! I substituted some fresh venison, and added 3 extra garlic cloves. The ground venison and spicy sauce complimented eachother soooo well. Oh the venison sounds like a yummy substitute. And I hope you and your wife enjoyed the cake! Sure! You can use your preferred ground meat…and let me know how it goes. Delicious and with lots a flavor. We saw your cooking meat balls, and they look so good, so I printed your recipe, but I must ask you what is epazote? I sort of miss that, again thank you so much for all the recipes that you share. Epazote is a type of herb…https://patijinich.com/epazote/ but you can substitute it with cilantro sprigs.